Asics is just about the most well-known and widely used athletic shoes available on the market. Like any athletic shoe brand they will continue to innovate to keep that market leading position. Asics currently have a variety of running shoes with different versions to try and meet the needs of a wide range of runners. Each of those versions is frequently updated. 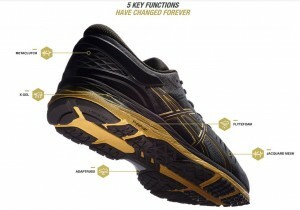 Asics recently announced a different model to the range, the Metarun. Not much was initially known about the footwear, simply a taster video clip on the Asics website and a countdown clock ticking down to a launch on November 12 2015. When the clock reached zero a tweet was dispatched by Asics to a video which revealed more details and the web page was updated with more on the running shoe. They are certainly declaring that this is their best ever running shoe. The Metarun shoe goes against the current tendencies of fewer gadgets and features in athletic shoes, adding several features which have patents associated with them. The midsole, labeled FlyteFoam, is their lightest and most sturdy midsole material. They mention â€œorganic fibersâ€ for the best level of cushioning. The shoe gets its stability from the patented AdaptTruss which is a carbon strengthened adaptive stability product. The â€œSloped DUOMAXâ€ is a dual density midsole which is meant to adjust efficiently to dynamic movement of the athlete. The upper features a glove-like, one-layer Jacquard Mesh as well as MetaClutch exoskeleton external heel counter with a built-in memory foam. There’s also a X-GEL hybrid high-tech gel in the midsole to aid cushioning. Is it their finest running shoe ever? Time will tell. Athletes will vote with their feet after they test the Metarun. There was a bit of discussion in social media prior to the release. These shoes won’t be obtainable until late November plus they are likely to be expensive and just obtainable in restricted release. "We have the Bill of Rights. What we need is a Bill of Responsibilities." This entry was posted in Running Shoes on November 13, 2015 by Admin.